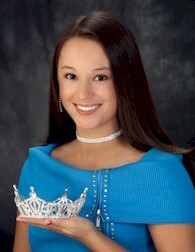 Haley Hannah, 16, a resident of Leawood, Kansas became the first Miss Teen Kansas on Saturday, June 12. The Miss Teen Kansas Pageant, hosted by the Miss Kansas Organization, was held in conjunction with the Miss Kansas Pageant on the campus of Pratt Community College in Pratt. The Miss Kansas Pageant is a preliminary pageant to the Miss America Pageant held in Atlantic City. Hannah attends The Barstow School and her honors and activities include the honor roll, Honor Council, Community Service officer, Relay for Life chairman, Dance Team, Tennis Team, Drama Club, and membership in Interlochen Center for the Arts/Musical Theatre. Hannah has extensive experience in theatre including performances at Starlight Theatre. She is a member of the Miller-Marley Competition Dance Team, the Starlight Theatre Starlight Stars/song and dance troupe, and The Barstow School Dance Team. Hannah has served as chairman for the Relay for Life event, held in Kansas City, and helped the event raise over $21,000 for cancer research. Hannah believes volunteer service is finding a passion within yourself. Personally, she indicates cancer research sparks that passion her. Her father is a thoracic surgeon and works with lung cancer patients and she had two grandparents die of cancer. As the first Miss Teen Kansas, Hannah will assist in promoting the Miss Teen Kansas program to young women and work with the new Miss Kansas, Megan Bushell, in promoting the Miss Kansas program and the importance of leadership, community service and volunteerism. The Miss Teen Kansas program provides an opportunity for teens, ages 13 – 17, to develop their competition, leadership, communication and public speaking skills. The program allows contestants to have a forum to present their talents and develop service and platform areas of interest and to gain knowledge about volunteerism, leadership and community service. The young ladies also have the opportunity to learn more about the Miss Kansas and Miss America programs.The Miss America Organization is the world's largest scholarship program for young women and one of the nation's leading achievement programs. The Miss America Organization has awarded more than $200 million in cash scholarships since the scholarship program began and makes available cash and in-kind scholarships at the local, state and national levels. Over $45 million is made available annually at the national, state, and local levels.